Do you face the problem which iOS explorer you should choose? There is a huge number of so-called NAS, FTP, Cloud or file managers / explorers for iPhone and iPad. But which are the best FTP – NAS – ‘Private iCloud’ Apps? I spent all lot of time and money in finding the right explorer. Finally, I got the right one and, in the later, I will tell you which one! Cloud services: I want to manage as many other clouds like Dropbox, Box, Skydrive, Google Drive, …. Today I must update my findings and admit that iStorage is not really the app I was looking for: There are too many crashes and files could not be opened in other apps via ‘open in’. But the design is clear and you can split te screen into two parts to move files via drag and drop. If the crashes are eliminated and the ‘open in’ bug is fixed, iStorage will be an excellent and workable app. Up to now there is not an universal app: FTP On The Go is an FTP client for the iPhone and iPod touch. FTP On The Go PRO is a FTP client for the iPad, iPhone, and iPod touch. Some information about my experience with FTP on the Go can be find in ‘troubleshooting-open-in-missing-apps’. Optimized for iPad, but also runs on an iPhone or iPod touch. View many files at once in the tabbed viewer. This lets you copy between files, compare, etc. Switch between browsing and full-screen viewing or editing with just a tap. Quick-scrollers let you scroll through files or folders. Download, Edit, and Upload web pages or any other text files on your FTP servers. Browse folders on your FTP servers (FTP, FTPS, & SFTP). Built in text editor with Search & Replace makes it quick to edit web pages or other files. Save files on your iPhone to view or edit later. Browse files on your iPhone from any computer with a web browser. 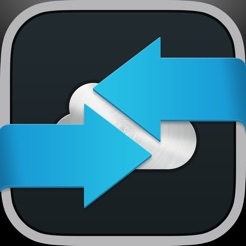 Use iCloud to share files between your devices. Smart Replace (see below) will not break your existing files if a phone call or lost connection interrupts the upload! Images from your iPhone camera or iPhone photo library can not only be uploaded to the server, but can be resized as you upload. Make them exactly the size you need. No “server disconnected” messages like you often see in PC FTP programs; FTP On The Go just reconnects if needed. Even set so passwords aren’t saved at all. You will need to enter them each time FTP On The Go is started, but for those that want that extra peace-of-mind, the passwords are never stored. Create, edit, rename, move and delete files and folders on your FTP server. Change file permissions on the server (CHMOD). Download and Upload whole folders with just a tap. * For sharing with the FTP and Web servers, all computers and iPhones will need to be on the same WiFi wireless network. File Explorer is the app that helps you to directly access your files on your remote computer (Mac, Windows, Linux) and Cloud Services (Dropbox, GoogleDocs) from your iOS devices. You could directly read your files without download. File Explorer saves the viewed files to local cache, so you could read them again without network access. If you want to download your files to iOS device, we offer you a powerful background batch download feature. Furthermore, File Explorer has lots of useful features for local files. You could use the built-in FTP Server to transfer files between computer and iOS devices over WIFI. Support file management, search etc. Taking everything into account File Explorer is up to now the app I was looking for…. Up to now I didn’t test it because of the in-app purchase of dropbox. Further more, so far I understood, there are no further possibilities to connect other cloud services. For example, File Explorer and, especially, iStorage do! Thank you for your review. File explorer was the last thing I needed to go comp free.